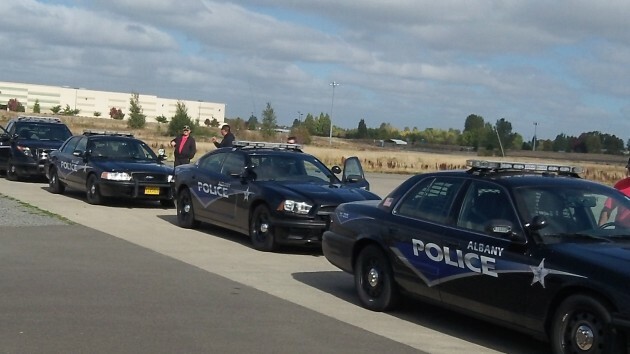 Albany patrol cars lined up for a Citizens’ Academy demonstration last fall at the state’s police training site in Salem. Albany voters get a chance in May to renew the city’s police and fire tax levy a year early, and if they do, about $80,000 of the first year’s amount will not be siphoned off for urban renewal. The rate of the yearly “local option” levy — outside the limit set by Measure 50 in 1998 — would remain unchanged at $1.15 per $1,000 of assessed value. The levy, totaling about $18.5 million over five years ending in 2020-21, would supplement other property tax funding of the police and fire departments. The Albany City Council Wednesday unanimously passed a resolution placing the measure on the May 17 primary election ballot. Voters first approved an extra levy for police and fire in 2002. They renewed it in 2006, and in May 2012 they did so again and increased the tax rate from 95 cents to $1.15. The latest five-year renewal extends through fiscal 2016-17. But since it was approved in 2012, the legislature changed the law to provide that newly approved special levies like this are exempt from losing some of their proceeds to urban renewal districts such as the Central Albany Revitalization Area (CARA). So, if the levy amount is collected under what voters approved in 2012, about $80,000 of its estimated $3 million in proceeds in 2016-17 will go to CARA. But if the old levy is replaced by the one on the ballot this May, CARA no longer gets a share. That was one reason the council called for a renewal election a year before the existing levy expires. The other reason is that in case the voters say no in May, the council has several chances to ask again before this extra tax funding ends. To pay its debts, CARA takes property tax revenue away from the purposes intended by voters. But in 2013 a couple of encouraging decisions were made. The state legislature passed HB 2632 and prohibited CARA from taking money from local option levies approved after January 1, 2013. Also, the Albany City Council passed a resolution to “remedy and make right” CARA’s impact on local bond levies approved after August 2013. These two decisions partially recognized the principle that property tax money must only be used for its intended purpose. The right thing to do is for CARA to retire its current debt and then find a different financing tool to obtain money. None of our property tax dollars should be diverted away from the purpose voter’s intended. If the voters are “allowed” to replace a levy, wouldn’t they be allowed to replace it with nothing if they so choose?